It’s no secret that I love my dog. No, really. I’m one of those people who are super addicted to their pets. Like, crazy addicted almost. Sometimes I let Mannie do things he probably shouldn’t, only because I love him too much to say no. I know, that’s like, Parenting 911, but it works for dogs 90% of the time but human children 0% of the time–that’s the difference. And at least I know I’d be a horrendous human parent. I mean, kids aren’t nearly as adorable as dogs are, so I’d be way stricter to my kid than my dog. Also, I’d probably want to spend more time with my dog than my child, and you can’t really get away with telling that to CPS and having them be okay with it. So alas, I’m not a parent to a human kid. But I am a happy, VERY proud parent to an amazing Border Collie, Mannie. If ya’ll didn’t know, I rescued Mannie three years ago from the Sacramento SPCA. He had been shot and lost his leg and needed someone who’d give him lots and lots of love. I’d seen Mannie on the SSPCA’s website, but it said he was in foster care. So I kind of gave up on the idea of getting him. Actually, it was my crazy ex-boyfriend who was hell-bent on getting a dog; I was just the person to help pick the new pup out. So when we went to the shelter to look at pups, I was pleased to see Mannie there! He smiled and jumped up in his kennel, eager to meet us. And the rest is pretty much history. Long story short: the ex is an ex for a reason, and after a custody battle, Mannie is now mine, 100%. And I couldn’t be happier. He’s my best friend, the light of my life, and has been by my side during some really tough times. The saying that “dogs are a man’s best friend” is completely true, as far as I’m concerned. Dogs don’t gossip excessively, they don’t judge you, and they don’t ask you if they look fat in a hideous outfit when you go shopping with them. Thank god for the latter. So Mannie’s fifth birthday was yesterday and I wanted to do something special for my special little man. 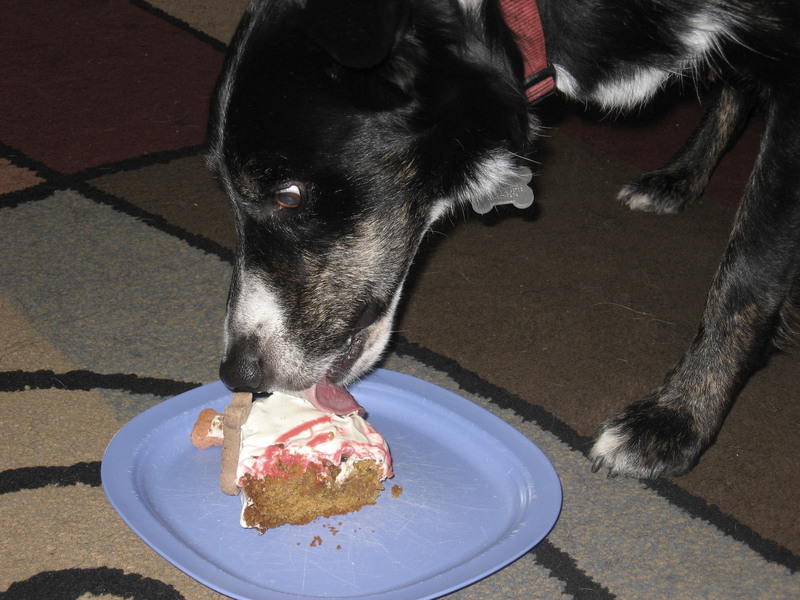 I contemplated making some dog biscuits, but I decided on a cake instead. After all, I am the cake queen. But as you know, dogs can’t eat the same human goodies as we can. So I had to make some modifications. 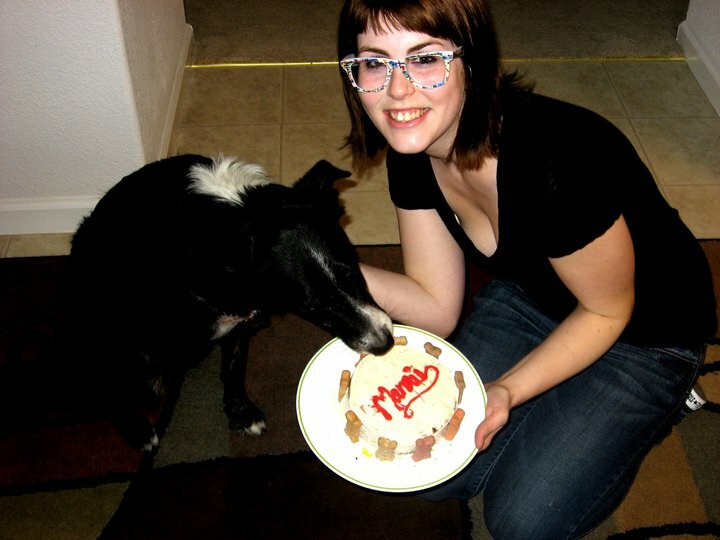 I got my recipe for Mannie’s Birthday Pupcake here, and surprisingly it was quite hard to choose which one to make. But with the ingredients I had on hand, I chose the Peanut Butter Carrot Cake. 1. Preheat oven to 350 degrees F. Lightly grease a small cake pan (I used a 6 inch round pan by Wilton). In a large bowl, combine flour and baking soda and mix. Add remaining ingredients and stir until well blended. Pour into prepared pan. Bake for approximately 30 minutes or until a toothpick inserted in the center comes out clean. Cool completely on a wire rack. 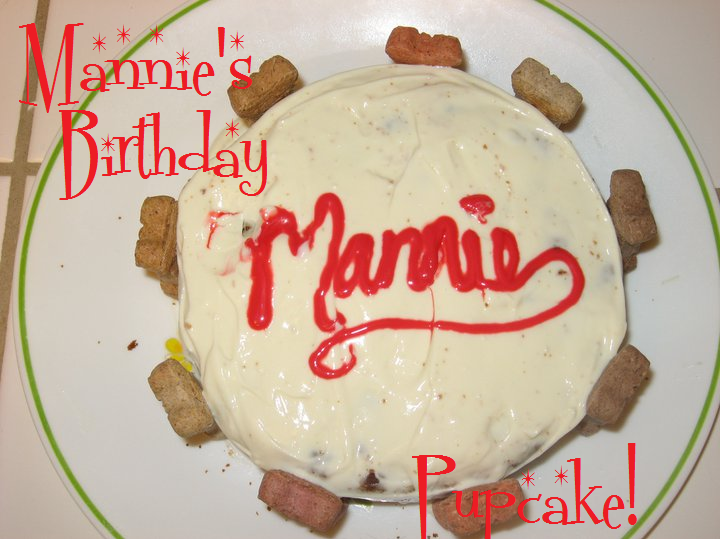 I also made a cream cheese frosting safe for dogs to ice Mannie’s cake with. 1. Blend together all three ingredients with a mixer in a medium bowl until well combined. Refrigerate until ready to use. 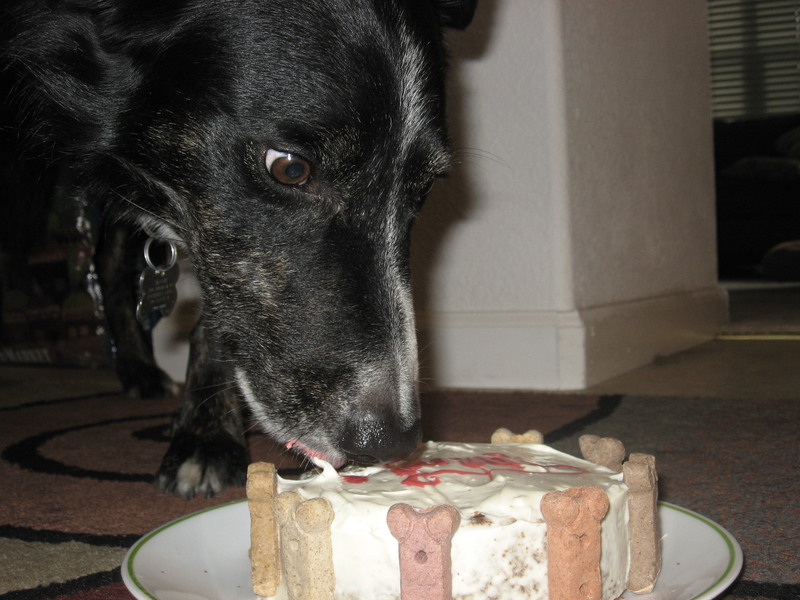 As you can see, Mannie couldn’t even wait to pose for a picture before digging into his yummy cake–I even decorated the sides with milk bones! Awh, ain’t he a doll? Of course, don’t feed your pup the whole cake at one time–I gave each of my dogs a quarter and popped the other two slices in the fridge for tonight. They loved it! And just think, you can get creative with any dog treats you have on hand as well. You could chop up softer dog treats for “sprinkles” or make a lattice-topped cake with Beggin Strips. You could even use Pupperonis to spell our words. Honestly, it’s about celebrating your puppy’s birthday more than the aesthetics, so do something nice for the animal in your life who does something amazing for you every day. LOVE THIS! I am making it for my dog weasel cause today is his birthday! :) xoxoD~!